for every one on the wheel. Think better (of me) next time. absolution’s constituents animal in appetite and why not? James Maughn lives in Santa Cruz, CA, where he a poetry co-editor for the literary arts journal Ping Pong, published by the Henry Miller Memorial Library. He also coordinates A New Cadence Poetry Series out of the Felix Kulpa Gallery in Santa Cruz. 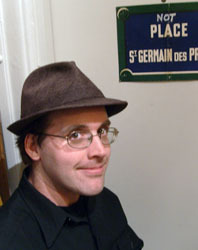 His first book, Kata, was published by BlazeVOX Books in 2009. He is a member of the Black Radish Collective, and his second book, Arakaki Permutations, will be published by Black Radish Books in 2011. Work has appeared in Otoliths, Lungfull, Parthenon West Review, TinFish, Big Bell, Sentence, Moria, Poetry Salzburg Review, Dusie, MiPoesias, and Horse Less Review. Another book, These Peripheries, will be published in 2012 by Otoliths Press.